I received a phone call in late November from Elizabethton resident Susan Peters, who informed me that one of her friends in a local hiking organization was hosting a hummingbird. But hummingbirds are summer birds from the tropics, right? Doesn’t the cold weather present a shock to these visitors? Actually, many hummingbirds are adapted to frigid conditions. Rufous Hummingbirds are quite capable of surviving freezing conditions, as long as they have access to a source of food. In spring, they migrate through California, before eventually spending the summer in the Pacific Northwest and Alaska. Not even an occasional bout of snowy weather has deterred this hummingbird from visiting a feeder at the home of Howard and Faye Guinn. The brownish hummingbird is hovering in front of the feeder. 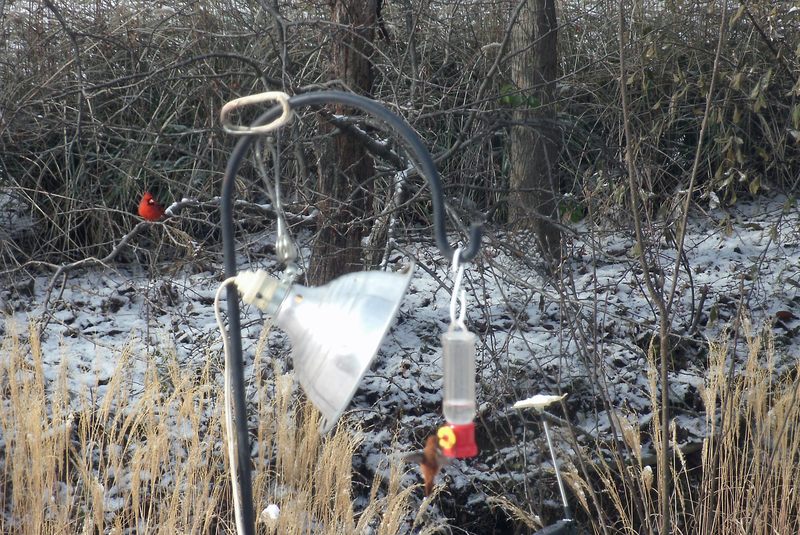 Notice a male Northern Cardinal is present in the photo’s background. The bird in question has been coming since Oct. 19 to a feeder at the home of Howard and Faye Guinn, who live near Jonesborough. Faye and I have corresponded by email about her hummingbird, which has already weathered a couple of snowstorms. “I was delighted to have a late hummingbird but never expected him to stay this long,” Faye wrote. When Susan contacted me, she said that the Guinns wanted to know if they should continue feeding the hummingbird or remove the feeder to encourage the bird to fly south. 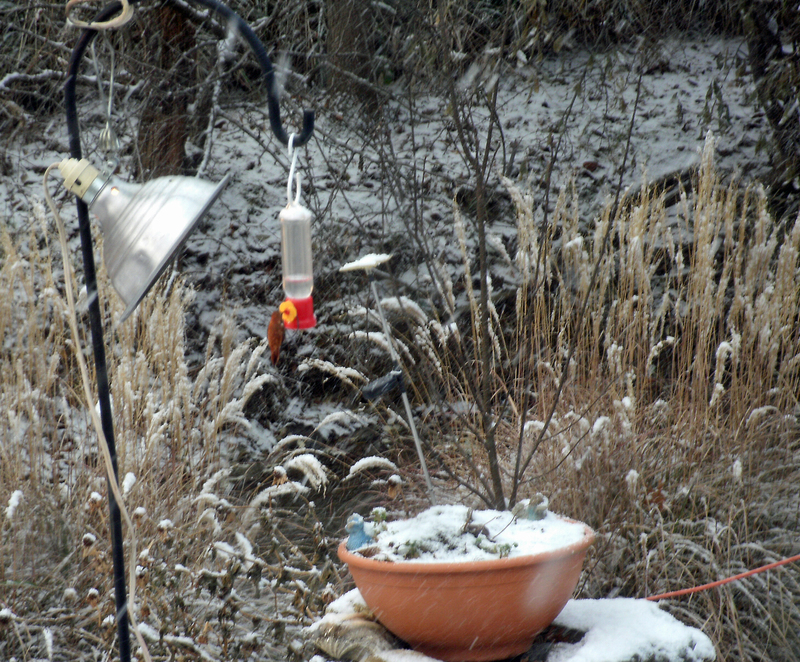 Photo Courtesy of Faye Guinn A heat lamp positioned near the feeder keeps the sugar water solution from freezing during bouts of frigid weather. I advised Faye in my email to continue to offer the sugar water, especially since other resources are scarce. These wintering hummingbirds are not entirely dependent on feeders, but they can make the difference during prolonged bouts of freezing weather. These hummingbirds will also sip from sap wells drilled into trees by Yellow-bellied Sapsuckers. Hummingbirds also feed on tiny insects. “Thanks for letting me know to keep feeding because some friends have said I should stop and he would go, but they are not birders,” Faye responded to my suggestion. “I am only backyard birder but do know a little. The hummingbird is somewhat camera shy and the photographs Faye has managed to get have been taken from inside her home. She has gone to extra effort to provide for her visiting hummingbird. “I take the feeders down — I have two so he has a choice — about two hours after dark on the nights it is to freeze and put it back out about 6:30 with a heat lamp,” she wrote. So far, her efforts have kept the bird healthy and content. “I never expected him to stay this long,” she said. 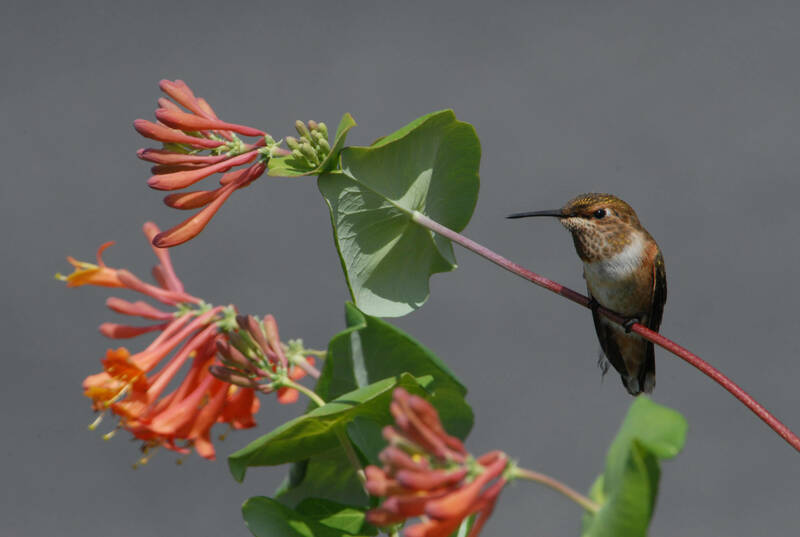 When she noticed the hummingbird for the first time on Oct. 19 she saw the bird at her Mexican sage plant. Her feeder was still available at the time, too. A male Ruby-throated Hummingbird hovers in front of the camera. 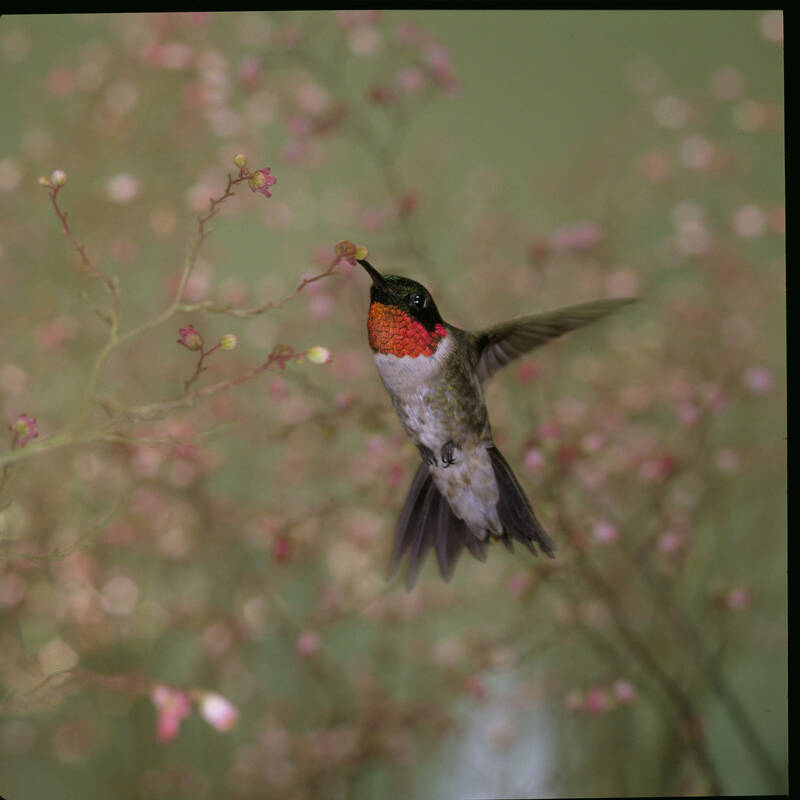 Ruby-throated Hummingbirds typically depart the region by the middle of October. The Rufous Hummingbird has basically become an expected winter visitor with a few reports being received each winter. I have observed Rufous Hummingbirds in many different locations, including Bristol, Blountville, Flag Pond, Elizabethton and Hampton. I have also observed Allen’s Hummingbirds in Mountain City and Johnson City. I know of records of these small birds from Erwin, Roan Mountain, Johnson City and many other locations throughout the region. A Ruby-throated Hummingbird is held with its wings spread during a study at the Bon Secour National Wildlife Refuge in Alabama. 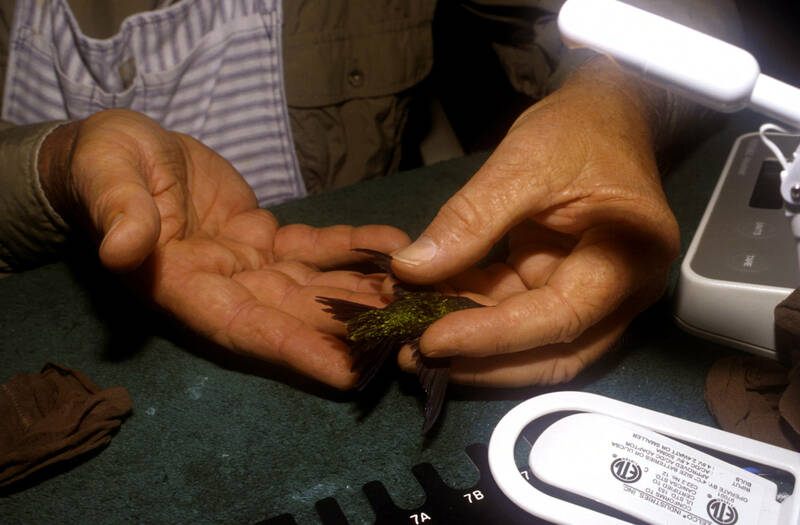 Mark Armstong, who works at the Knoxville Zoo, has banded many of the western hummingbirds that migrate into the region on an annual basis. I have continued to correspond with Faye, who confirmed that the bird has remained resident throughout November. As of Dec. 7, the hummingbird was still visiting the feeders at the Guinn residence. A Rufous Hummingbird perches on a flowering vine. This hummingbird nests as far north as Alaska. This entry was posted in Birding, Birds, Hummer/Bird Study Group, Hummingbirds, Our Fine Feathered Friends, Uncategorized and tagged Rufous Hummingbird, Rufous Hummingbirds, Selasphorus hummingbirds, Wintering hummingbirds on December 7, 2014 by Bryan Stevens.